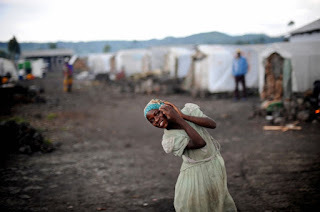 A young girl playing near her temporary shelter in the camps for refugees in Kibati, north of the provincial capital of Goma, Democratic Republic of Congo. Thousands of people are living in these camps, displaced from their homes due to the fighting between the Congolese rebels, led by Laurent Nkunda and The Democratic Republic of Congo government troops. The conflict-ridden eastern region of The Congo has seen over 800,000 people flee their homes in the past year.